Isaac and Seth Galena, the brothers behind the popular Jewish humor site Bangitout.com have once again published a Seder Sidekick to help bring some levity to the Passover Seder. Dedicated to the memory of Dr. Harold Galena, the 38-page PDF document includes song parodies, top ten lists, silly jokes, quizzes, and funny pictures. 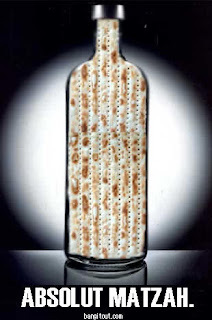 The online Seder, created by Rabbi Laura Baum and Rabbi Robert Barr of Cincinnati's Congregation Beth Adam, will take place on Tuesday, March 30 at 5 PM EDT and participants can sign up at on the Seder website. The online Seder will use the award-winning Haggadah, made by the congregation, that creates a Passover ritual that is meaningful, relevant, and appropriate for all modern-day Jews. It provides direction for beginners and comfort for seasoned participants as they celebrate Passover. Last year, Rabbi Baum tweeted two Passover Seders on Twitter. Baum and Barr's OurJewishCommunity.org reaches out to thousands of unaffiliated Jews and others who are looking for a meaningful connection to Judaism, but had not previously found one. The Open Source Haggadah allows users to assemble a personalized haggadah from texts and images that come from a diverse and inclusive array of Jewish sources, including -- most importantly -- user generated content. Launched in 2002, the site was a proof-of-concept for Open Source Judaism, a view which proposes that Judaism is not simply a religion to be believed in, but one to be considered, discussed, and evolved. Jewish texts and rituals are not closed, but open to commentary, disagreement, and even revision. Inspired by the values expressed in Douglas Rushkoff's Nothing Sacred: The Truth About Judaism, the Open Source Judaism Project sought to advance public discourse around the use of technology in the reimagining of our relationship to Jewish texts and ideas. The Open Source Haggadah was the first in a series of experiments that illustrated the value of giving individuals the ability to "customize" their Judaism and Jewish experiences. This Wall Street Journal article has some new ideas to make the Passover seder more fun and interactive using Twitter, Charades and "Jewpardy." Rabbi Oren Hayon of Dallas thinks he has just the way to integrate "American Idol" into the ancient tale of the Haggadah. Building on a growing movement to add a bit of fun to the plagues and pestilence, he has recruited a handful of fellow rabbis to act out the Passover story in 140-character Twitter messages, accessible at twitter.com/tweettheexodus. Of course, you can also rely on the good old Plagues Bag. Israeli technology maven Jacob Richman has compiled a list of links to various forms of Passover humor. He posted 70 Passover files ranging from jokes and stories to song parodies. Both kids and adults will find them entertaining (and sometimes educational). The Passover humor website includes the First Plague as reported on Twitter, Pesach Cleaning 2010, the Computer Engineer's Haggadah, Dr. Seuss 4 questions, and An Adam Sandler Passover.